The November 5 shootings at the Fort Hood Army post dominated much of the online community last week, registering as the No. 1 story in both the blogosphere and on Twitter, despite occurring late in the week. On YouTube, however, international events earlier in the week remained at the top. The attack that left 13 dead and 30 wounded, allegedly perpetrated by Major Nidal Malik Hasan, generated condolences and commentary from the online community. And as was the case in mainstream media last week, some of that conversation focused on the suspect’s Muslim religion and possible motives for the attack. But perhaps more significantly, the Fort Hood rampage highlighted the emerging role of social media-particularly Twitter-in producing instantaneous accounts of breaking news events. And indeed the accuracy and value of that reporting became a topic for discussion. 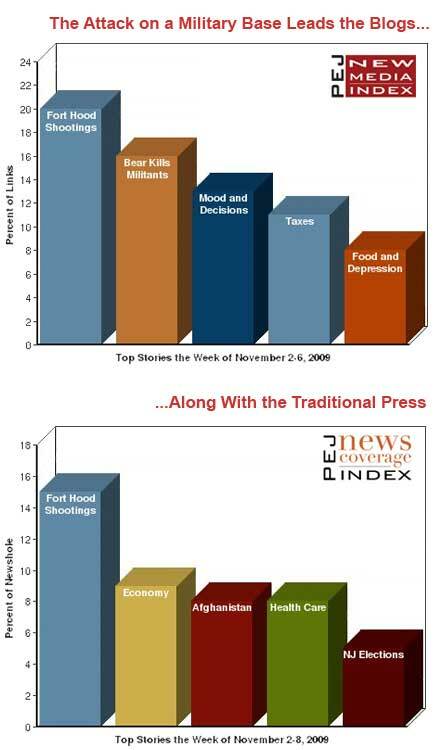 From November 2-6, 20% of the links to news-related stories from blogs were about Fort Hood according to the New Media Index from the Pew Research Center’s Project for Excellence in Journalism. On Twitter last week, the shootings were also the top subject, receiving 38% of the news links for the week, according to the tracking site Tweetmeme. But those numbers don’t fully reflect the intense interest in the story. The shooting only encompassed the last day of the week studied (occurring mid-day Thursday, it was reflected in Friday’s coverage). 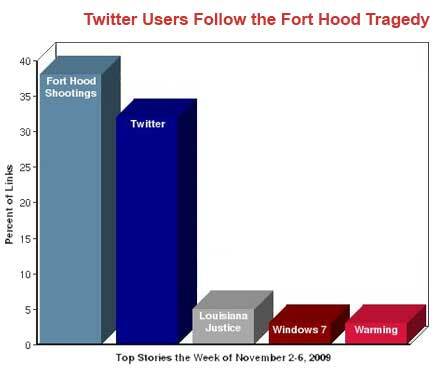 On that day, Friday, November 6, fully 67% of the blog links and 88% of the links on Twitter were about the Fort Hood rampage. The other top stories, which occurred earlier in the week, represented a diverse mix of subjects. On blogs, the second-largest story (16% of the links) was a November 3 BBC report about a bear in Indian-administered Kashmir that killed two militants hiding out in the bear’s cave. A story about an Australian psychologist who claims that grumpy people are less gullible and better at communicating finished third at 13%. Fourth, at 11%, was a Los Angeles Times column by William Voegeli claiming that California’s high tax-high benefit economic model is less effective than states with lower taxes. And a study suggesting that a diet high in processed food can increase the risk of depression, also from the BBC, finished fifth at 8%. On Twitter, the second-largest topic was Twitter itself with 32% of the week’s news links. That included a November 4 CNN.com article by the founder of Mashable about the connection of Twitter to real-time journalism, ironically posted one day before the events at Fort Hood. The third story, with 5%, was about the resignation of Keith Bardwell, a Louisiana Justice of the Peace who gained notoriety after refusing to marry an interracial couple. A Wired report that the new operating system Windows 7 was vulnerable to viruses was fourth at 3%, while several stories about global warming-a hot topic online for the last few weeks-finished fifth at 3%. As the media scrambled to report the Fort Hood attack, social media played an important role. A number of Twitter users and bloggers claiming to be stationed on the base quickly posted eyewitness accounts which some mainstream outlets then incorporated into their own online coverage. The actions demonstrated both some of the value of these immediate communications and also the traditional media’s willingness to incorporate them into their own coverage. Tearah Moore, who identified herself as a Fort Hood soldier just returned from Iraq, posted a number of tweets that were picked up throughout the Web. "Ft Hood is on lockdown. Some guys just shot 19-25 people. As least 11 died so far. I’m at the hospital right now. Please pray for all of em," Moore wrote. An anonymous blogger claiming to be at Fort Hood posted updates under the pseudonym Porphyrogenitus. "I’m here working at Casey Library on post, and we’re on lock down as there was a shooting rampage (that’s what people are calling it) at the SRP site at the former Sports USA down the street from us. Apparently 7 are dead and 15 injured." Porphyrogenitus later updated, arguing that media accounts of chaos at the base were inaccurate. "There is no chaos here that is detectible, everything is very orderly and people are doing what they need to. The use of the word ‘chaos’ just set me off. There will probably be a lot of bogus descriptions used by the ignorati we rely upon for information." A number of well-known media outlets, such as the New York Times, NBC’s Today Show and The Huffington Post, took advantage of the flow of online information as they set up Twitter lists that aggregated these types of eyewitness posts and also the feeds of other news organizations near the scene. The lists from The Today Show and The Huffington Post, for example, both included tweets from local news sources such as TV station KCEN and the Fort Hood Sentinel, as well as numerous individuals located in and around the base. The Austin-American Statesman went a step further, creating its own Twitter account that relayed raw information as soon as they received it. It included updates on the suspect and information directed toward people on the base. "Killeen ISD has locked down its 9 schools on the post. The other schools in the district have not been locked down," the paper tweeted soon after the events occurred. Later, it linked to pages that described how area citizens could donate blood to the victims. However, in the rush to report on events at Fort Hood, some misinformation spread quickly, most notably that there was more than one shooter in the attacks and that one was killed during the incident. The initial sources of the false information are still unclear, but by the time it was corrected, many in both the mainstream press and social media had reported it. For example, the Statesman Twitter account reported, "Officials say the shooting began at 1:30 p.m. CST and that two shooters are believed to be involved." They later added, "Texas Gov. Rick Perry says there were three shooters, 1 was killed, 2 are in custody." After the initial confusion gave way to the facts, an online debate emerged about the effectiveness and accountability of real-time social media reporting. Megan Garber wrote on the Columbia Journalism Review site that these Twitter lists compiled by news organizations were beneficial and "represent a vast improvement over the previous means of following breaking news in real time. Lists also represent, more significantly, a new-or, more precisely, a newly facilitated-way for news organizations to collaborate: they allow news outlets essentially to co-opt others’ reporting. But in a good way-to the benefit of the news organizations in question and, of course, their audiences." Paul Carr at Tech Crunch, a technology-focused blog, strongly disagreed. Given the magnitude of the tragedy, a number of online commentators used Twitter and blogs to express condolences for the victims. "Pause to say a prayer . . . for those slain and wounded at Fort Hood, those who love them, those impacted by and affected by this shooting . . . and for all victims of gun violence," requested Mark Koenig on the blog Swords into Plowshares. But just as the coverage in the traditional media quickly began to examine the role Major Hasan’s religion may have played in the killings, much of the online commentary also pivoted to focus on that sensitive subject. "I hope this isn’t a religious zealot," declared the blog S350. "It’s sounding like it a bit. Even if this guy was such a monster (which I’m not convinced of), I hope the majority of Americans, and especially the majority of the military, which can be even more prone to stereotyping, don’t take this as standard policy for Muslims. It’s not. Go meet a few; they’re just people." "We know he is a Muslim, but of course the media wants to make nice and doesn’t want to ruffle any feathers although I’m quite sure if the guy had been remotely Christian they would not have hesitated to mention it or have talking heads on discussing the resurgence of right wing extremism due to racism or something," argued The Truth in Black and Right. "There is a groundswell of Muslim honor killings, and attacks on civilians, and foiled Muslim terrorist plots in the past several years. The more Islamic attacks that are perpetrated on American soil, the more attacks will be inspired by lone Jihadists and small cells," wrote songdongnigh at Lock and Load as details were first emerging. "It’s long past time to wake up and realize that Islam is the greatest threat to Western civilization ever. This attack is a symbolic strike at the American military to try to get the US to withdraw from the war on Islamists." And although a distinct minority, a few bloggers quickly blamed President Obama for the attacks. "Was he [Hasan] motivated by a Commander-In-Chief who apologizes for every international action ever taken by the US, who praises Islam and snubs Christianity at every opportunity, whose military strategy comes from snobbish Ivy League scholars who’ve never carried a rifle, or operated a tank?" asked John Allison, III, at America, You Asked for It! "And as long as President Obama continues to provide aid and comfort to our enemy, through direct propaganda and appeasement, and through his elitist, idealistic approach to military strategy, each one of these deaths should be laid at his doorstep." The most viewed news videos on YouTube last week had a distinctly international flavor to them. The top video was a brief report from Russia about a fork-lift driver who drove into shelves that came crashing down on him. The dramatic closed-circuit footage shows a significant amount of damage, although the driver was reportedly unharmed. The second and third most viewed videos were both in Portuguese and involved the same controversy at a Brazilian university. Geisy Arruda, a 20-year-old student, wore a mini-dress to class which led to harassment from her classmates and expulsion for disrespecting "ethical principles, academic dignity and morality." The fifth video shows an unidentified Italian man warning that the H1N1 vaccine is dangerous and encouraging viewers to read a letter by Dr. Claudia Rainville, a psychotherapist and author who has made similar claims. The information accompanying the video suggests that the vaccine is harmful and part of a government conspiracy.